Unidentified assailants believed to be connected to the police on Tuesday ambushed and severely beat a Vietnamese dissident a day after he tried to shield a prominent woman land rights activist from harassment and attack by suspected government agents, according to the victims. Nguyen Chi Duc displays his wounded face following an ambush by unidentified assailants, April 9, 2013. 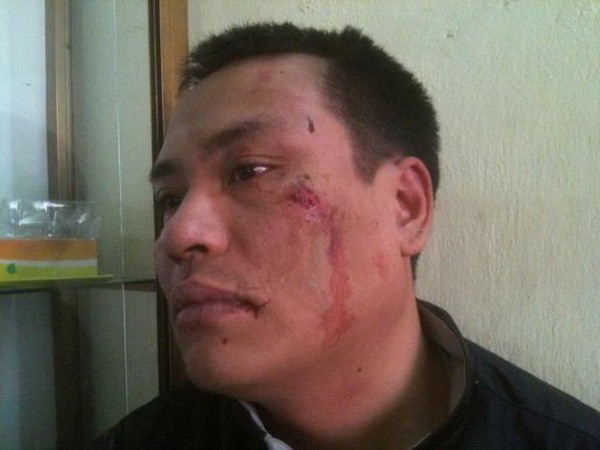 Five or six men appeared suddenly from a bush and beat dissident Nguyen Chi Duc with heavy sticks, knocking him off his motorbike, as he was on his way for lunch near his office at Thang Long industrial park in Hanoi, Duc said. The attack appeared to be in retaliation for his protection of land-rights activist Bui Minh Hang from harassment by suspected agents working for government security forces who had followed her on Monday from her hometown of Vung Tau to Hanoi over a lawsuit she had filed. “I am 100 percent convinced that it was policemen who attacked me,” Duc told RFA’s Vietnamese Service, adding that his attackers kicked him in the face and struck repeatedly at his head, which he covered with his arms. After the assault, Duc rode on his motorbike “to another place,” lay down to rest, and called a friend for help. On Monday, Duc had accompanied Bui Minh Hang, a frequent critic of Vietnam’s one-party communist state, when she arrived in Hanoi in response to a letter sent by the Hanoi People’s Court. The letter concerned a lawsuit she had filed against Nguyen The Thao, chairman of the Hanoi People’s Committee, over his role in what she called her “illegal” detention the year before in a reeducation center. “Nguyen Chi Duc and some friends in Hanoi went with me because they were worried about my safety,” Hang told RFA’s Vietnamese Service on Tuesday. “People had followed me from 10:00 a.m. until about 2:00 p.m.,” said Hang, who at one point took a picture of her pursuers. When they arrived at the Hang Da market in the center of Hanoi, three men from the group tried unsuccessfully to provoke Nguyen Chi Duc into starting a fight, Hang said. Alerted by Duc, a crowd pursued the man and stopped him, Hang said. The man then took out a piece of paper that identified him as working for the police, Hang said. Later, Hang said, the men followed her to a café where she was sitting with friends. “He and the others were searching for Chi Duc,” she said. The attacks on the two dissidents came after a prominent Vietnamese blogger said that he and his family in central Vietnam were victimized Monday by unidentified men believed to be agents of local security forces angered by his online writings. Huynh Ngoc Tuan, 50, told RFA’s Vietnamese Service that two men pulled up at his home in Quang Nam province on a motorbike just after midnight on Monday and threw a rank liquid containing fish heads and human waste at his house. “We wrote essays and articles that they don’t like, so they attacked our family and harassed us,” Tuan said. “This is not the first time. They have done the same thing to other dissidents,” he said. Vietnamese authorities have jailed and harassed dozens of activists, bloggers, and citizen journalists since stepping up a crackdown on protests and freedom of expression online in recent years. Many have been imprisoned under Article 88 of the Vietnamese Criminal Code for “conducting propaganda against the state,” and international rights groups and press freedom watchdogs have accused Hanoi of using the vaguely worded provision to silence dissent.